Have you made a crostata before? It’s the Italian version of the French galette. Crostatas and galettes are actually the exact same thing: a free-form fruit pie cooked on a baking sheet instead of in a pie or tart pan. I called this one a crostata though, because in my head galettes are fancy, where you layer the fruit in concentric circles and use apricot glazes and all that fussy-business, and crostatas are rustic (read: uglier) and easier. Anyway, crostatas are awesome. All the benefits of a pie, without all the fussiness of crimping and topping. Plus they cook faster (this one is done in 35 minutes!) and the outside is crisper too! The short cooking time is great for summer berries, which don’t need to be cooked all that much anyway, so I wanted to try it out for this months blackberry pie. This crust was inspired by the amazing tart crust from Melissa Clark’s gorgeous tomato crostata combined with my favorite gluten free crust dough from Joy the Baker. They worked beautifully together and the dough was supple and easy to roll out (it pays to add an egg to gluten free pie doughs!). The cornmeal isn’t really discernible but does give the crust a bit of a pleasant crackly-ness. The blackberries though! I used 4 cups of blackberries from the farmers market, and they were super tart. I sprinkled a quarter cup of sugar on top of them and thought, man, that looks like a lot of sugar! I didn’t want the filling to be overly sweet, so I stopped there. It was a mistake! The berries were still crazy crazy sour. Next time I’ll add a full half cup of sugar (that’s what I’m writing in the recipe below) and then taste and add even more if needed. Sour or no, it was still warm and rich and fruity, and that’s good enough for me! 1. For the crust: Combine the flour, cornmeal, sugar, and salt in a medium bowl. Using a pastry knife, cut the butter into the flour mixture until only a few pea-sized pieces of butter remain. Combine the coconut milk and a squeeze of lemon juice, then beat in 1 whole egg and stir until well combined. Fold the coconut milk mixture into the flour and butter mixture with a rubber spatula. Use your hands to bring the dough together into a ball using a few folding squeezes, and then flatten it into a disk, wrap in plastic wrap, and chill for at least an hour, or up to overnight. 2. Preheat the oven to 425 degrees. Line a baking sheet with parchment paper. Roll out the chilled dough on a well-floured counter until it is approximately 12 inches in diameter, then carefully transfer to your lined baking sheet. Put the sheet pan in the refrigerator while you prepare the filling. 3. For the filling: Put the blackberries in a medium bowl and gently toss with the 1/2 cup of sugar. Taste your sugared berries and decide if they need more sugar, then add the cornstarch, lemon zest, lemon juice, and a pinch of salt and mix gently. 4. 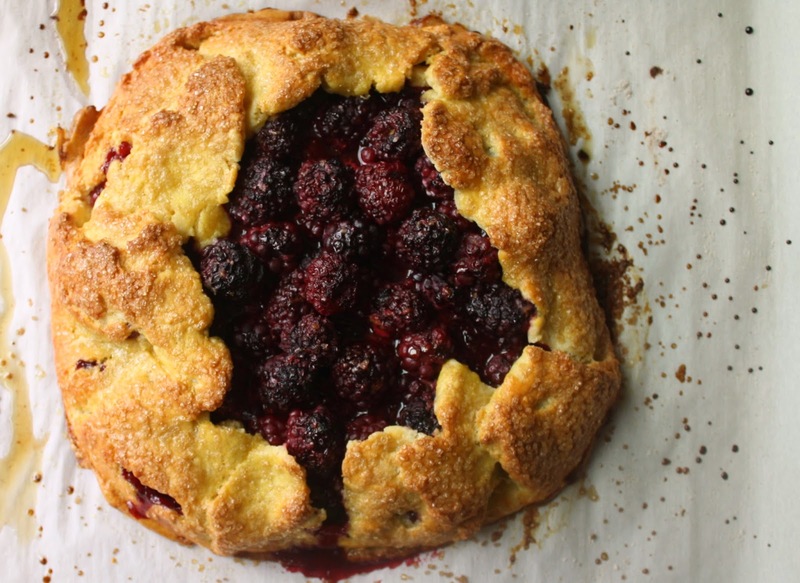 Assemble the crostata: Take the baking sheet out of the fridge and tumble the berries and their juices into the center of the dough circle, leaving a 3 inch or so margin around the edge of the dough. Fold the dough up around the filling, pleating it here and there, and pinching closed any cracks that form. Brush the crust with egg wash and sprinkle the whole top (crust and filling) liberally with turbinado sugar. Put the sheet pan in the preheated oven and bake for 35-40 minutes, or until the crust is deep golden brown and the filling is bubbly. Enjoy warm or at room temperature, with a scoop of something resembling vanilla ice cream!